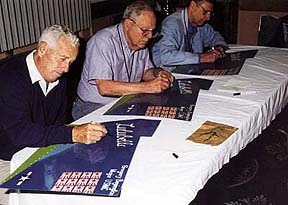 On 23-25 May 1997, Velasco Enterprises hosted a small Black Sheep reunion where the signatures of the three pilots were acquired on the limited edition panels. 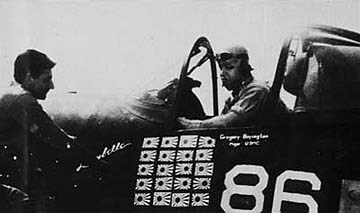 Panel size: 18" x 28"
Boyington actually never flew this Corsair in combat. It was prepared for this photo to illustrate his victories for publicity as he became more popular. 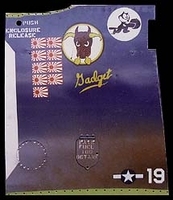 There were no aircraft assigned to the "Black Sheep" therefore no markings other than kill flags were adhered to the fuselage. 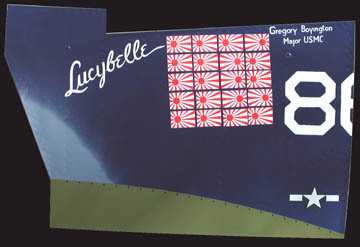 New information has been published that reveals Boyington had a lover named Lucy Malcolmson which on further inspection of the photo, supports the name Lucybelle.